What meaning comes to mind first when you hear the word gather? I thought of bringing people together, gathering a group around a table. The other way to think about gathering is in the act of obtaining ingredients for a meal. You go out to gather what you will prepare, and that might be from a garden, a farm, a forest, the ocean, or the grocery store. The new book Gather: Everyday Seasonal Food from a Year in Our Landscapes by Gill Meller is really about both uses of the word but he focuses on what’s available for gathering from the landscape at different times of year. For him, it’s not the source of the ingredients that’s as important as the experience of the time and place for the flavors they offer. He encourages taking a moment to enjoy the first taste of a dish that’s particular to a season. Of course though, he also points out that considering the journey made by the ingredients before arriving on the plate makes cooking and eating more rewarding. The recipes here aren’t complex, but there are some new and different combinations of flavors. The chapters are organized by places where the food might be found like Farm, Seashore, Garden, Orchard, Field, Woodland, Moor, and Harbor. There are simple compositions like Goat Cheese with Rhubarb and Lovage served on toasted bread, Spring Cabbage Salad with Honey and Sprouted Lentils, and Barbecued Little Gems with Cucumber White Beans and Tahini. There are salads, main courses, and sweets sprinkled throughout each chapter. There are tomato and zucchini dishes in the Garden chapter that I’ll be turning to as soon as those star ingredients appear this year, and the Harbor chapter had me marking almost every page. The dish I had to try first was something new for me: Pickled Mussels. 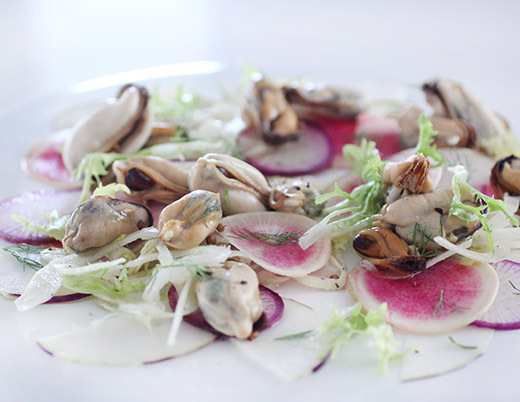 The cooked mussels are quickly pickled in apple cider vinegar with coriander seeds, and they’re served with crisp radish slices. In the book, apple slices are included but I opted for fennel instead since it’s in season here. Like all the recipes in this book, this one is about subtle flavors that add just the right note to a dish. Apple cider vinegar was very specifically chosen as was coriander seed. In the spirit of gathering what is available at this time of the year, I brought home locally-grown purple daikon and watermelon radishes for their pretty colors and peppery flavors. The thinly sliced fennel added sweet, fresh, anise to the mix. To prepare the mussels, I always soak them first in water with a little flour to purge them and pull off any remaining beards or debris. After being drained and rinsed, the mussels went into a large pot with a half-cup of boiling water to which a couple of bay leaves and some thyme sprigs had been added. I was delighted to gather those herbs from my own yard. The pan was covered, and the mussels opened after a couple of minutes of cooking. They were removed from the pan, and the cooking liquid was strained into a bowl. When cool, the mussels were removed from their shells. Cider vinegar, coriander seeds, some of the cooking liquid, and salt and pepper were combined and poured over the mussels. This was left to sit while the other ingredients were prepped. The vegetables were all thinly sliced with a mandoline and scattered over plates. The mussels and dressing were added to each, and I placed a few frissee leaves among the arrangement. 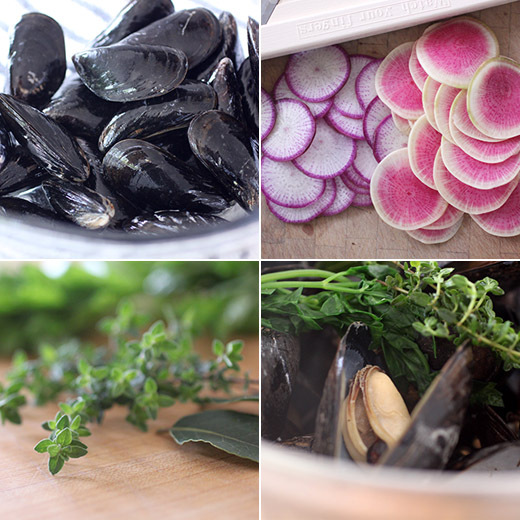 In a short amount of time, the mussels take on nice pickle-y flavor from the apple cider vinegar. And, the crunchy, fresh vegetables make great partners for it. This was surprisingly good for such a simple mix of things. I’ll be thinking back to this book as I gather what’s freshest and best in the coming weeks and truly enjoying the flavors. Recipe excerpted with permission from Gather: Everyday Seasonal Food from a Year in Our Landscapes by Gill Meller, published by Quadrille March 2017, RRP $35.00 hardcover. 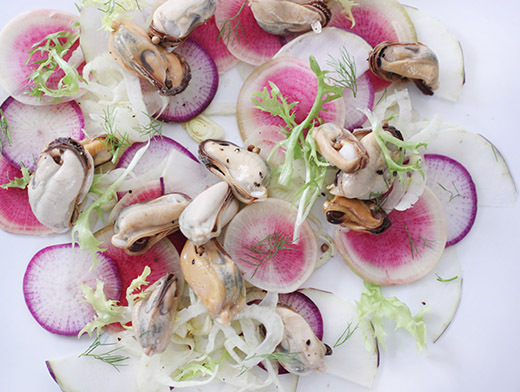 There is something of Normandy in this fresh salad: a bicycle ride down the Route du Cidre; a peppery-pink radish with delightfully fresh, cold butter; a bowl of plump, yellow wild mussels, cooked in cream on some beach off Gouville-sur-Mer. It’s almost like you taste it in French. This dish is about perfectly cooked mussels, sweet, crunchy apple, and the acidity of good cider vinegar—and how they all play out when they get together. I love the orangey air that toasted coriander seed brings to the delicate pickle—it’s well worth a try. You can prepare the mussels the day before, but I like them best once they have cooled and before they see the fridge. Place a large pan over high heat. Add a scant 1/2 cup [100ml] water, the bay leaves, and thyme sprigs. When the water is boiling hard, add the mussels, and place a close-fitting lid on the pan. Cook, shaking the pan once or twice, for 1 to 2 minutes, or until the mussel shells are all just open. Turn off the heat, then drain the mussels into a colander set over a bowl to catch the cooking liquor. Discard any mussels that haven’t opened up. When the mussels are cool enough to handle, remove the meat from the shells, and place it in a bowl, reserving the drained cooking liquor. Add the cider vinegar, sugar, coriander seeds, and 2 Tbsp of the cooking liquor to the mussel meat, stir through, then season with a little salt and pepper. To serve, quarter and core the apple and then cut each quarter into 2 or 3 wedges. Divide the apple pieces roughly between two plates. Slice the radish into 1/16 to 1/8 in [2 to 3mm] rounds, and scatter them over the apple, along with any radish top leaves, if available. Finally, spoon over the mussels along with plenty of their coriander-spiked dressing, and serve immediately. You know what you think when someone walks into a gigantic closet filled with various types of clothing and proclaims: “I have nothing to wear?” I suspect people could think the same of me when I stand in front of shelves of cookbooks and say “I can’t think of anything new to make for dinner.” That problem may be solved once and for all with the latest book from Melissa Clark, Dinner: Changing the Game . First, it’s full of great-looking recipes, but each of those comes with options for tailoring it to suite your taste or what ingredients you may have on hand. And, there are suggestions for what to serve with the main dishes to help you make a complete dinner plan. It starts with a whole chapter just for chicken; then there’s one for other meats, a ground meat chapter, fish and seafood, eggs, pasta, tofu, beans, grains, pizzas, soups, salads, and dips and side dishes. I always mark interesting pages with sticky flags as I read a new cookbook, but this time, it got out of hand with the number of flags attached to pages. I cooked from the book for three days in a row, and I have another page marked for dinner tonight. I started a weekend with the shrimp balls shown here for Friday night dinner. Then, I made the Sticky Tamarind Chicken with Crisp Lettuce for a Saturday night meal, and the options for that include using bone-in, skinless chicken thighs or boneless thighs or breasts or wings depending on your preference. The flavorful, marinated, roasted chicken was served over a fresh lettuce salad with sliced jalapeno and cilantro leaves. The next morning, I made the Chilaquiles with Tomatillo Salsa and Baked Eggs for brunch. The layered corn tortillas with spicy green salsa and lots of melted cheese was a delicious base for the eggs that baked on top. I added some chopped greens between the tortilla layers just to include more vegetable goodness in the mix. Tonight, I’m going to make the Warm White Bean Salad with Arugula Pesto and Preserved Lemon. And, all those other marked pages? There are too many to mention, but a few include Cumin-Chicken Meatballs with Green Ghile Sauce, a savory Herbed Parmesan Dutch Baby pancake, Pasta Carbonara Torte with Tomatoes and Sage, Chile and Ginger-Fried Tofu Salad with Kale, and Leek Tomato and Farro Soup. None of the recipes are over-complicated or too time-consuming, and you’ll see the time required listed next to the number of servings. I was actually surprised at how quickly the Thai-Style Shrimp Balls came together. The dipping sauce was a quick mix of soy sauce, rice vinegar, minced fresh ginger, lime juice, sesame oil, and sliced green onions (I tend to skip the sugar in sauces like this because I prefer the tartness). Shelled and cleaned shrimp were chopped into small chunks, and there’s no need to worry too much about how small the chunks are. The shrimp does not need to be minced, just quickly chopped into little pieces. The chopped shrimp was combined with more minced ginger, minced garlic, finely chopped chives, an egg white, lime zest, and some salt. The mixture was formed into little one-inch balls. They’re not as firm as meatballs, but they hold together fine. Just line up the balls on a parchment-lined baking sheet. To steam, I used a bamboo steamer with its own top in a large skillet, but any type of steamer will work fine. Napa cabbage leaves were used to line the bottom of the steamer, and I was lucky to get the last of Boggy Creek Farm’s Napa cabbage for the season. The leaves I was using were small enough that I could arrange them with two shrimp balls on each. Once the steamer was placed over simmering water, it only took a few minutes to cook the shrimp balls. I removed each cabbage leaf with the shrimp balls sitting on it, and served it in the same arrangement. Last, I garnished with more chopped chives and some black sesame seeds. As mentioned in the recipe head note, you could serve the shrimp balls with rice noodles or plain rice, but I went for more of a pick it up with some cabbage like a little wrap kind of thing. And, these diminutive balls packed incredible flavor. The ginger, garlic, and lime zest brought a lot of zip. With this new book, I definitely have no excuse for not coming up with something new to make for dinner. Reprinted from Dinner: Changing the Game . Copyright © 2017 by Melissa Clark. Photographs copyright © 2017 by Eric Wolfinger. Published by Clarkson Potter/Publishers, an imprint of Penguin Random House, LLC. These juicy, ginger-scented shrimp balls are like the filling inside your favorite shrimp shumai, sans the wrappers. And since you don’t have to enfold each one individually in dumpling dough, they come together really quickly and steam up in minutes. If you don’t have a steamer basket, it’s a good thing to pick up. They are inexpensive, and the collapsible ones don’t take up much space. Or, a decent hack is to crumple up four large foil balls (at least 1½ inches in diameter) and place them in the bottom of a pot with a tight-filling cover, filled with ½ inch of water. Rest a plate on top of the foil balls to keep it above the water, bring the water to a simmer, and put the food directly on the plate to steam. It’s not ideal, but it works in a pinch. 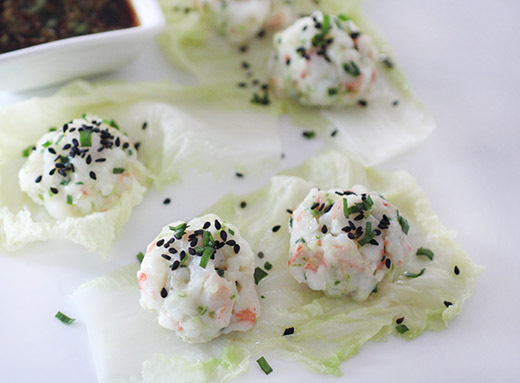 Serve these shrimp balls over white rice (page 276) or rice noodles coated with a little sesame oil, which will give you a dumpling-like texture if you eat some shrimp ball and noodles in the same bite. A salad made from pea shoots and drizzled with a little of the dipping sauce, below, would round it out nicely. They also make nice hors d’oeuvres for a dinner party. 1. Make the dipping sauce: In a medium bowl, combine the soy sauce, rice vinegar, 1 tablespoon ginger, lime juice, sesame oil, and brown sugar, and whisk until the sugar dissolves; then add the scallions. 2. Line a baking sheet with wax or parchment paper. 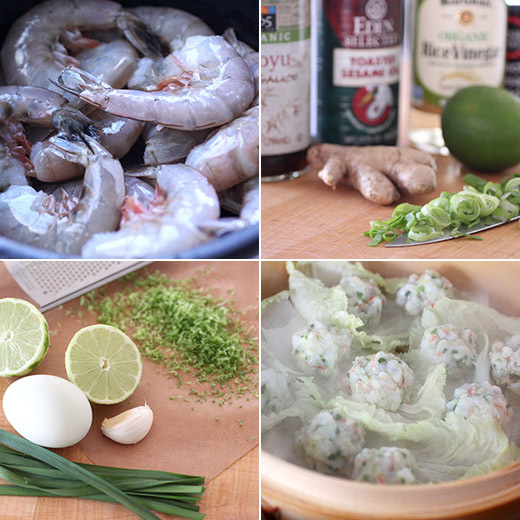 In a large bowl, combine the shrimp with 1 tablespoon of the ginger and the garlic, chives, egg white, lime zest, and salt. Mix well, and form the shrimp mixture into 1-inch balls. Place them in a single layer on the prepared baking sheet. Chill them up to 4 hours if not steaming immediately. 3. Lay one or two cabbage leaves over the bottom of a steamer basket to just cover the surface. Put the steamer in a pot filled with an inch of water and bring the water to a simmer. Working in batches, place the shrimp balls on the cabbage leaves, cover the pot, and steam for 3 minutes, turning them over halfway through. After each batch, transfer the shrimp balls and the cabbage leaves to a plate. Use fresh cabbage leaves for each batch. 4. 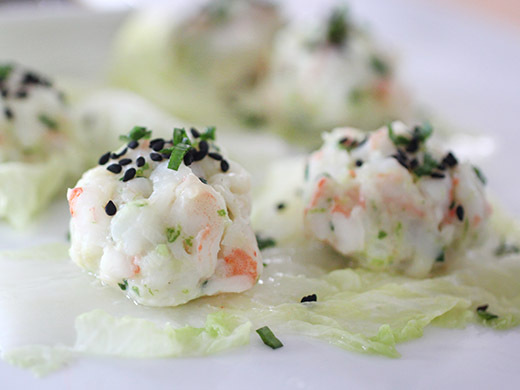 Garnish the shrimp balls and cabbage with chives, and serve with the dipping sauce on the side. You can eat the cabbage or not, as you prefer. I’ve been known to brag that my compost pile smells like citrus. I do go through quite a lot of citrus fruits in my kitchen, and I’ve never met a type I didn’t like. So, it was no surprise that the new book Citrus: 150 Recipes Celebrating the Sweet and the Sour by Catherine Phipps has a lot of recipes I want to try. And, it’s such a pretty book with a bold, orange-yellow cover and full-page photos of several of the fresh- and zesty-looking dishes. In some cases, the citrus is the main ingredient, in others it’s a necessary flavor component, and the ingredient involved may be the zest, the fruit, or the leaves. I’ll definitely be trying the Barbecued Halloumi in Lemon Leaves as soon as my trees look happy and full of new greenery for the spring. And, the Sprouting Broccoli with Blood Orange Hollandaise is a twist on this sauce that I’ve never thought to try before. The Coconut, Lime, and Lemongrass Chicken Salad with radishes, carrot, and zucchini looks like a winner, and Roast Vegetables with Feta and Orange would be great as a side or a vegetarian main dish. The Desserts chapter has me craving Mandarin Creme Caramel and Blackberry, Orange, and Orange Blossom Clafoutis. There are also recipes for marmalades, jellies, candied zest and peel, and drinks with citrus. Since burrata always stops me in my tracks and since blood orange season is nearing the end, I had try the Blood Orange, Burrata, and Freekeh Salad. This salad highlights the blood oranges with pretty slices placed front and center, but there’s also bergamot zest and juice adding flavor to the freekeh. This was my first time using bergamots. They appear late in citrus season, and I feel kind of lucky to have found them the day I was looking. Their fragrance is citrusy-floral and a bit like that of lemon blossoms. If they’re not available, lemon zest and juice is the best substitute. The freekeh was soaked in water, drained, and then cooked with garlic and bergamot zest. 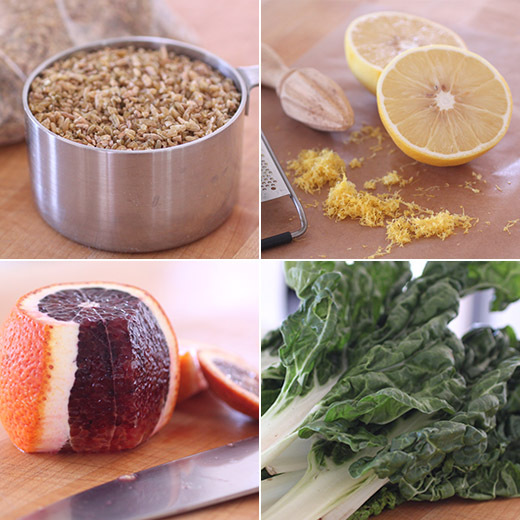 Once tender, the bergamot juice was added, and the freekeh was left to stand for a few minutes before being drained. Red onion wedges were sauteed in olive oil, and chard was cooked until just wilted. 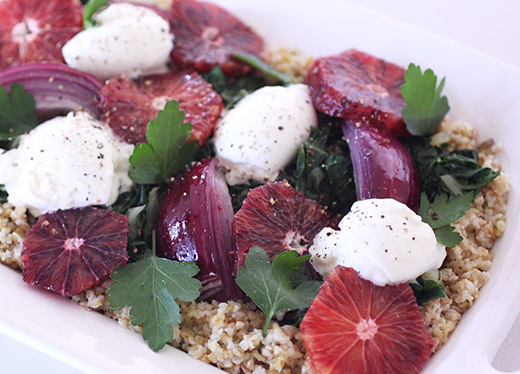 To serve, the freekeh was spread on a platter, onions and chard were added on top, peeled and sliced blood oranges were added, and pieces of burrata were nestled into place. Last, a drizzle of olive oil went over everything, and I garnished with parsley leaves rather than mint because that’s what I had available in my herb garden. 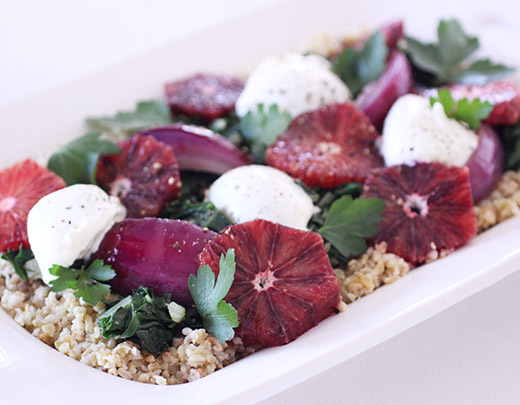 Blood oranges with burrata is a wonderful thing, and the chard and nutty freekeh were great with that combination. I quickly fell for the flavor and perfume of bergamots which were a lovely addition to the grain. A lot more citrus pieces will be added to my compost as I cook more from this book, and it’s going to smell amazing. Recipe excerpted with permission from Citrus: 150 Recipes Celebrating the Sweet and the Sour by Catherine Phipps, published by Quadrille April 4, 2017. This is a very happy confluence of ingredients; smoky nuttiness from the freekeh, earthiness from the chard, a creamy sweetness from the burrata, all pulled together by the fragrant, sweet-sour citrus. The bergamot is purely optional as its flavour is subtle here, but if you can, please do: bergamots are still in season (just) when blood oranges come in, so it should be possible to find them. Use lemon zest instead if not. First cook the freekeh. Soak it in plenty of cold water for 5 minutes, then drain and rinse thoroughly. Put in a medium saucepan with the stock, garlic and zest. Season with salt, then bring to the boil and leave to simmer for 15–20 minutes until cooked – it should be plumped up but still with some bite. Add the bergamot juice and leave to stand for a few minutes before straining. Heat the olive oil in a large frying pan. Add the onion wedges and sauté over a medium heat until starting to turn translucent – you want them softened but not completely collapsed. Add the chard, along with the water, and cook over a gentle heat until the chard has wilted down and the stems are still al dente. Season with salt and pepper. Arrange the freekeh over a large platter and top with the onions and chard. Pour over any reserved juice from the blood oranges – there should be a fair bit. Break up the burrata over the salad, then top with the orange slices and mint leaves. Drizzle over a little olive oil.